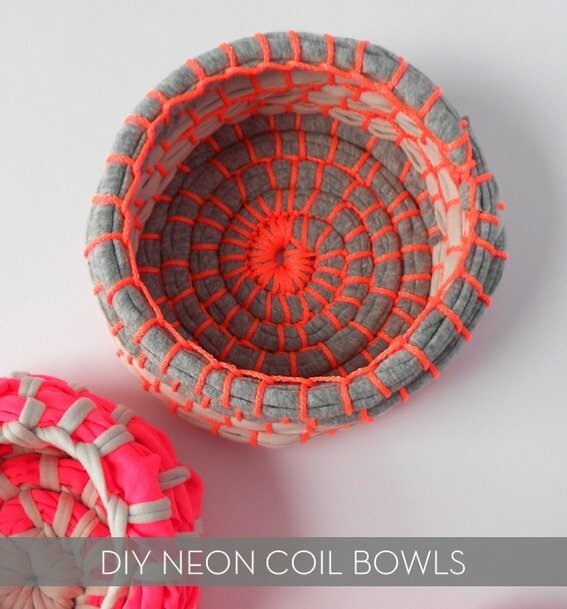 I remember making a coil bowl from scrap fabric as a kid -- it turned out terribly. Now that my dexterity and attention to detail and general craftin' skillz have increased, I really want to give this trendy neon version a go. Make It: Colorful String-Wrapped Earbuds! Sure, there are earbuds available with a few pops of color on the ends, but the cords are always white or black. BORING. Add some personality and flair (and help keep them tangle-free) with this easy DIY project -- you may even find yourself wrapping all your gadgets in string! Garden light season is right around the corner, and I spotted a great DIY project to kick this off. Michelle made her string of lights using twine, but to give them variety in the color department, she shot them with Rustoleum. To check out the entire tutorial, head on over to Pocketful of Dreams. Make It: DIY Neon String-Wrapped Vases! In case you hadn't noticed, I am totally into DIY vase projects lately! From paper polygons to faux milk glass, I can't get enough of 'em. So, of course I was excited when I spotted this easy string-wrapped vase project -- the pops of neon are perfect for spring! It's easy enough to do with your kids, and cool-looking enough to actually hang on the wall. DIY Idea: Make a Decorative Ampersand! ...or whatever character your heart desires. Love the letter "C"? The number "5"? This easy DIY decor project is customizable, great looking, and practically free! How To: Spruce Up Your Tea Towels with Tassels! Last week we shared a roundup of (awesome) modern tea towels, but if your priority is to 'make do', I say you may as well make it pretty, too! Jessica took the string ball idea and ran with it, creating a gorgeous string ball chandelier. The chandeliers were the perfect addition to the outdoor dining experience, but they would be equally pretty inside as well. Hearts-on-a-string...Super quick, super easy, and a great use of scrap paper. AND! 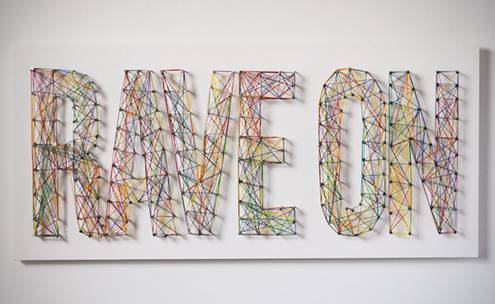 This stands out as the kinda project you can do while in a meeting or class, and make it look like you're totally paying attention!